On the first, dated July 13, the nine items added up to $32.93. There was $2.31 in tax. The total should have been $35.24, but next to the “total” line on the receipt, it said $35.25. The next receipt, with the same sale date, showed a subtotal of $8.64. The tax was $0.60, so the grand total should have been $9.24. But no. 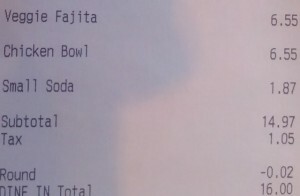 With Chipotle-style math, the total was $9.25. The third receipt, dated July 17, had a subtotal of $17.75 and tax of $1.24. The total? $19.00, but elementary school students would have come up with $18.99. Dang you for posting this near lunch time while I’m at school! Did this happen in Canada where there are no pennies? I guess it only happens at some “high volume” chipotles. I went to Chipotle last night and got 76 cents back, so your milage may vary. Report back on your results! Also I believe that the Canadians are too nice to say something if they got shorted a penny.